So I just bought and assembled the FT-5 at the end of November. I've noticed that a lot of makers have the BL-Touch on there printers. Is this a needed add on for the new version FT-5? Can someone explain the idea behind it for me, I'm new to this and would love some helpful feedback. It is used to compensate for an out of level or non-flat build surface mainly. Or for printers where bed leveling is either difficult or impractical. It is basically a tiny servo motor that extends a sensor pin to a point below the print nozzle during auto-level operations and then retracts it during prints. If you synchronize the two Z motors together (or have an R2 printer that has only one Z motor as you do), have everything tight and leveled, and use a mirror tile or other super flat build plate it probably isn't needed. You will of course need to check the bed level periodically and adjust it anyway. There are several threads on this forum that discuss synchronizing the two motors, and many others concerning build surfaces including mirror tiles, Pyrex plates, milled aluminum plates and others. Thanks Ron that is super helpful. I guess its not a necessity but more of a comfort. I noticed that there are many servos out there that do this. What in your opinion would you say works better than others? I don't use BL-touch at all, never have, and don't feel the need for it on my printer's setup. Others, even on this forum, may disagree greatly. My printer is Z-motor synchronized and uses mirror tiles. Plus I only have four bed leveling screws. If you install all six (or even eight as some have done) and don't use mirror tiles or Pyrex/borosilicate build surfaces it may be very difficult to level the bed. With four, or as some have done- three, adjusters it is pretty simple and doesn't move around a lot unless you are printing bowling balls. If you are going to install a servo-driven level sensor you might as well go with a genuine BL-touch because it is all contained in one tiny package and is fairly well supported (lots of "how to" discussions). Anything else and you are probably on your own support-wise, and will have to fabricate all the component parts that surround it. You might check out "allen key" level sensors on YouTube and elsewhere. There are some extremely clever non-servo level sensor designs that people have come up with. Thomas Sanladerer and others have really good video discussions of all the various styles of level sensors that can be found on YouTube. I am actually thinking about an optical system, but not because I am having any leveling problems or feel a pressing need for it. Rather I am just experimenting with something that could potentially eliminate the Z-home switch entirely and which would be self-adaptive to differing thicknesses of mirror tiles, build surfaces, tape or no tape, and so forth. But I am not ready to share anything on it. Again thanks for the info. That really helps to make up my mind. 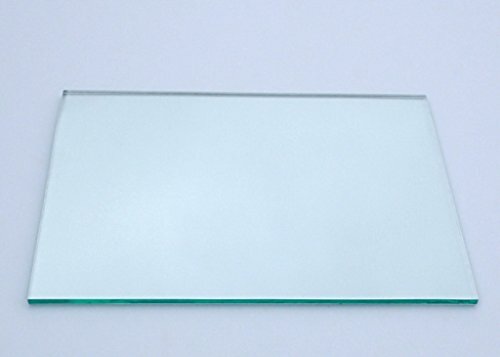 You mentioned using a mirror tile, right now I'm using the borosilicate glass. Is one better than the other? Borosilicate glass is better. Hands down. Mirror tiles are about $0.80 each at Lowes. Guess why I use them. P.S.- I keep one for ABS and one for PLA so I don't have to clean them quite as rigorously (ABS juice on the first, glue stick on the second). Borosilicate is not necessarily "better - hands down". Yes, it works, and works just fine. I am in the mirror tile camp - have been for years. In fact, I dare say I am the one that started it in the Folgertech universe. Mirror is going to be flatter than Boro glass. Mirror has to be nice and flat to provide good reflections, and is actually ground & polished to be so. Boro glass is not. As for the BL Touch - Have never used one, and probably never will - and I have 5 printers in total right now. Learn how to properly level the bed, and use a good flat surface to print on, and you should not need one. I have a bl touch and agree that knowing how to manually level the bed is very important. I use mesh leveling so way more accurate when it works and automated so 1 less thing i have to do before printing. btw there is a bed level test in thingyverse. i print that with about 8 lap brim and manually adjust while brim is printing. just my way no idea if its good or not LOL The issue is with the bed movement. Especially the FT5 with dual z motors is prone to losing position. at power off\on especially. it is possible and IMHO frequently happens that 1 motor will drift 1 way and the other goes opposite (normal for stepper motors to drift when power is lost and snap to nearest position when power applied.) end result is a tilted bed (linked z drive should correct this) The bltouch is nice for automating the print process once you know the machine is good to go, it can be added to the pre batch with stuff like priming and wiping nozzle for a nearly hands free printing setup. more about convenience than anything i dont use if for an end stop, just leveling. Most of the borosilicate glass plates I see for sale for printers claim to be flat. I don't know, having not used any of them. So you are probably right. The main advantage to it though is that it handles heat far better without warping or cracking. Plus it is much tougher in general than mirror tiles and therefore safer to handle. So I would still say "hands down" for mechanical reasons, but that is only my opinion. "Float glass" on the other hand is dead flat because of how it is manufactured and is what most mirror glass is made of to start with. Then it is usually polished to be even better, but mostly for optical clarity. So I definitely do see your point. If you were the one who started the mirror tile movement here, thanks! Great idea. I honestly can't remember where I first saw something about it. @PaulS 's writeup of dual Z motors and their issues is spot on. That is why I sync'd mine together during the initial build of my printer and have never, not even once, operated with them independent of one another. And because of that I have never had any problems with the two sides being out of level. Front-to-rear yes, but side-to-side, never. I have some ideas to fix that as well but have been too busy with other things to worry about it. forgot to mention i use a pei sheet as well. great stuff, no slurry hair spray glue stick, tape or even rafts needed. How do you clean it? Just curious. That is one advantage to mirror tiles (or glass in general). I can take a single-edged razor knife to it (a "Widget" actually) and just scrape off the old coating. Then a quick wipe with IPA and on with the new coat (ABS juice or glue stick as the situation requires). super easy. alcohol and paper towel quick wipe down. light sand with 600+ grit from time to time and good as new. I have used mirror tiles for years, starting with my first printer, a Solidoodle 4, that was purchased used. It was suggested in Soliforum to help level out the warped aluminum beds they invariable develop (too thin) - and it does work - to a point. There comes a time, however, that the thin aluminum needs to be replaced - and I have done so on both of the SD4s that I have - but I still use the mirror tiles to print on. It was just a logical extension to use them on other printers as they were obtained & built. I will say this -- I do not remove the mirror tile from my printer - unless it is getting replaced for some reason. I stick it down to the aluminum bed with hairspray and it stays there until it needs to be replaced for some reason. So far I have only had to replace one due to a chunk being taken out out of it with a print... never had one crack on me - knock on wood. I also recently replaced one simply for aesthetics when I updated a few other parts recently - it had spots of the backing coming off - not really sure why, or what was causing it, but it had been in/on the printer for well over a year. To clean, I use Windex & a single edge razor blade to remove any chunks of stuff, then wipe it down with a paper towel... respray with Aqua Net (covering/blocking motors & fans) and am good to go again for many prints. FWIW, 99% of my printing is done in ABS - I very rarely need to resort to ABS juice to get good adhesion. My FT-5 is a first generation and has the dual motors. Can't say I have ever had a problem with the 2 sides getting out of sync with each other, tho. It is currently set up with the CNC add-on kit (that was kind of a disappointment, tbh) so it doesn't get a lot of use right now. one of these days I am going to stick the hotend back on it. Just been too busy with other things. I still use the stock paper clamps to hold the mirror tiles to the heated aluminum plate (which is 1/4" thick on mine). I was using some Sil-Pad between the aluminum and the mirror tile but very recently stopped because I discovered that the pressure of those clamps was compressing it more than I had thought it would. This in turn caused the mirror tiles to become very slightly convex in their centers. Not a lot, and not enough that I had actually observed any particular negative effects on the prints. But I noticed it when checking the bed leveling at the corners after performing other modifications recently. So I removed it and the mirror tile bowing went away. I installed a modification to the Z-axis guides last night that I had been planning for a while. I now have doubled up linear bearings at all four corners. The bed used to have some angular "play" front-to-rear. Not any more, unless I apply a lot of off-center pressure to it. It is now quite solid. For me this puts the final nail in the coffin for a bed level sensor. At least for my particular printer and needs. I too print the majority of my objects in ABS because if nothing else I can vapor polish them and it is trivially easy to bond parts together. Using ABS juice and mirror tiles I haven't had many adhesion problems lately, and very few warpage issues as long as I throw a shop towel over newly completed prints and wait patiently for them to cool down. Interesting thread, I haven't got my FT-5 100% running yet but I am very close. Does the metal plate warp or something, is that why you guys use mirrors and glass to stay flat? I read that the borosilicate glass is great because it doesn't expand as much and obviously is much stronger because it's built for the heat. Is something like this recommended? This is my first printer, I have the bed level right now however if it is going to warp in high temperatures I should be careful, since I'll be doing ABS stuff for work eventually. Does a mirror last through the 100C temperature? Is that less expensive and still great to use? @heartless if you have gone to those high temperatures for ABS and recommend a mirror maybe I can find something at a garage sale to cut to size. @Ron so you're using mirror for the bed as well? Is that what "Mirror tile" is or am I wrong? I'm going to build a plywood box around my FT-5 to keep the climate in there and allow it to cool slower for the ABS. Mirror tiles work great. That is all I have used, so don't consider my statement authoritative. That said, I have had no issues with the heat (100C) and the tiles. They are flat, inexpensive, and if one does break, well like I said they are inexpensive. I lay the tile directly on top of my silicone heating mat. Thus far, I haven't even needed to clamp it down as the mat has that silicon tackiness to it. The mat sits on top of a cork bed and then the original heated build plate support the cork. I use four leveling screws, and found it very easy to adjust. From what I can tell there is some sagging (warping) of the stock aluminum build plate, even without heating it, so the glass is just a no brainer. Alright awesome I'll check some places for mirrors. You said the mirror is directly on your mat but then you mentioned cork bed. Should I just put it directly onto the heating bed or have something in between? The glass sits right on the bed. The cork is for insulating the silicone mat. The mat has two bulges and wires on the bottom, so the cork also provides a pocket for these to lay flat of the aluminum plate. You will probably need to use some clips or make some corner brackets to keep the glass in place. I got my tiles from ikea, but I think you may be able to get them at some of the big box hardware stores like Lowes. Looks like they are now $1.66 each (at Lowe's anyway). I bought mine a long time ago when they were much cheaper and perhaps on sale. I haven't outright broken one yet but the edges can get a bit chipped if the clips slip off. I have run the bed up to 125C on a number of occasions with no ill effects. The one you show from amazon is the wrong size for an FT-5. It is 300x200, but is the right idea. Find a 300x300 version and you are good to go. Notice its thickness (6mm) though. That is a major consideration in all of this. Any aluminum heater plate will warp somewhat simply because it will naturally be a bit cooler at the edges. It may bow up, it may sag down, but it is not likely to stay dead flat. The glass (of your choice) is a more stable surface in that regard. Borosilicate (Pyrex) is, as you said, stronger, doesn't expand as much, and is usually much thicker than mirror tiles which tend to be really thin (like 2.5-3mm). They are typically less than 1/4 the rigidity and strength of 6mm borosilicate. @Ron wow that is great, my store has it for $10 right down the road so it was probably on sale though they usually have sales. yea I noticed that one was 300x200 after I posted it but I wouldn't buy anything on amazon anyway this type of stuff is almost always cheaper at a shop. that is good though I am sold on the mirrors, they are of course very well smoothed out and flat from how they're created and if they withstand the heat that is all that is needed for us. you just put it in the corner screw of the bed and it holds down the glass, II'll have to edit it to fit the lowes glass, it might work nicer than the clips.